Choosing a career is no easy task. Deciding what you want to do for the rest of your life is tough to say the least. What if you make the wrong choice? What if you choose something that makes you miserable, or leads to stress and money worries? What if something terrible happens to that industry? 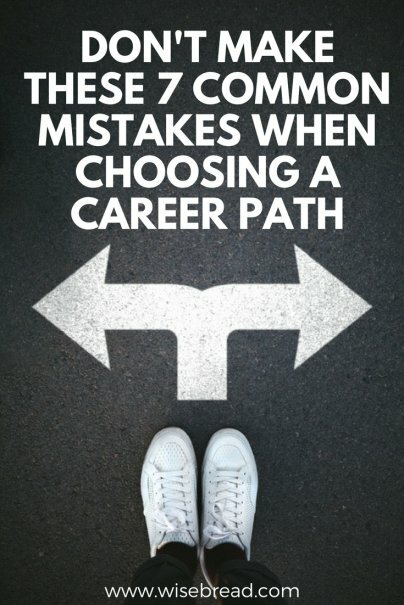 There are so many what-ifs when it comes to choosing a career. But if you avoid making these big mistakes, you should be in a good position to make a wise choice. Industries come and industries go. At one time, there was a thriving buggy whip industry, but it disappeared when the automobile became popular. Sign painters used to get plenty of business until machine-cut vinyl and large-scale printing replaced that industry. Very few career choices are bulletproof, and you need to look to the future to see if the industry you want to be in has a good chance of being around in 20 years' time. For example, mortgage brokering took a big hit during the Great Recession and the number of people working in that profession fell nearly 45 percent in the decade between 2007 and 2017. While the housing market bounced back after the subprime mortgage crisis, regulations have changed the industry for good and made it harder for mortgage brokers to earn the kind of money they used to make. They say money can't buy happiness. Tell that to all the people struggling to pay bills and put food on the table. However, while money — and the security it brings — are major considerations for any career path, they shouldn't be the only aspect you focus on. Taking a job purely for the money sends you down a path that will almost certainly result in unhappiness. We spend the majority of our lives working, and if you are miserable for that amount of time, you will have wasted your life. Sure, you'll have a nice car, big house, and fancy clothes, but if you spend every day hating the job that provides those things, you won't get much enjoyment out of them. In most industries, there are ladders to climb. You start off on the bottom rung, you work hard, pay your dues, and climb to the top. Corporate America is a prime example of that, with people coming in as junior managers and rising all the way to senior vice president, or even CEO. There's a certain amount of pressure that comes from upholding the traditions of the "family business." Your father was a mechanic, his father was a mechanic, your two brothers are mechanics … so you'll be a mechanic. From military careers and law, to plumbing and real estate, there are thousands, if not millions, of people who have simply followed in the footsteps of their parents. And a good portion regret it. Is that what you really want to do? Will it make you happy? Are you doing it just to make Mom and Dad happy? Remember, this is your life, and you only get one shot at it. Follow your passion. "I don't know what to do, but this looks OK. I can always switch careers later." Does that sound familiar? Do you have friends or relatives who have said that, and now they're stuck in a career they cannot stand, but can't get out of? It happens a lot. People take a job because it's convenient, pays the bills, and gets them something to put on their resume. But then they get experience in that industry, which leads to a raise or promotion. They acquire more skills that are specific to that career path, excluding them from other industries. While you don't want to take a job for the wrong reasons, you also don't want to exclude yourself from good opportunities just because they're not quite perfect. There's a line in National Lampoon's Christmas Vacation about the chronically unemployed Cousin Eddie that always gets a laugh: "Catherine says he's been holding out for a management position." It's obviously ridiculous, but for some people, it rings true. They do not want to jump into anything unless it is the absolute perfect fit for them. No compromise. No wiggle room. It either checks every single box, or it's not good enough. This thinking can lead to disappointment and frustration, and at some point, you may pass on a great career because it isn't 100 percent "right." No career is. Those people earning millions a year on Wall Street have issues with their careers. Nothing is perfect. As long as there are way more positives than negatives, you're doing well. There are skills that people just seem to be born with: artists and designers, mathematicians, musicians, and so on. However, never forget the famous words of George McFly in Back to the Future: "If you put your mind to it, you can accomplish anything." Do not close off certain fields because you don't know the first thing about them. Do they interest you? Does the idea of working in that profession make you feel excited? Well, find a way to make it happen. Take the classes. Put in the hard work. Give it everything you've got. Believe in yourself, and you will find that there is almost no career you cannot take on.